The polygraph or "lie detector" is an instrument, not a machine. The instrument measures a person's involuntary physiological responses to a stimulus, which is typically in the form of a question asked during the examination. The instrument is supported by four sensors worn on the body that monitor and record: thoracic and abdominal muscle responses, cardiac activity, and electrodermal resistance. The polygraph examination process is frequently referred to as the Psychophysiological Detection of Deception (PDD), within the academic field of Forensic Psychophysiology. Modern instrumentation is digital, which allows for computerized analysis of the data, as well as by the examiner. The most prominent analytical software algorithm was developed by the Johns Hopkins University Applied Physics Laboratory, and is among the resources used by Abacus Forensic Polygraph for data analysis and evaluation. Frequenlty Asked Questions (FAQ) & Other Important Information is HERE. The act of lying is deliberate; it is a choice, not an accident. Distinct and subtle changes occur in a person's body when they tell a lie. Field research documenting these physiological changes supports that accuracy for specific polygraph examinations can be as high as 98%, with a consensus of 88%-94% being more widely accepted. 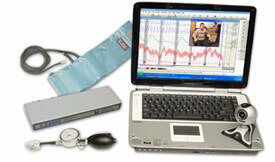 The polygraph is consistently deemed the best and most reliable way to independently evaluate a person's truthfulness. Most states, including Arizona, and some federal circuits allow polygraph examinations as evidence under stipulated admissibility. [State v. Valdez, 371 P.2d 894 (Arizona, 1962)]. Voice Stress Lie Detection? . . . . Don't Be Scammed! Although the manufacturers of voice stress gadgets frequently tout their products as a completely accurate and a more flexible option for lie detection, research studies by the Department of Defense, the Department of Justice, the University of Florida (2006), and others into the field of voice analysis repeatedly showed that stress in a person's voice has no correlation with actually lying. An investigation done by ABC PRIMETIME revealed voice stress gadgets to be simple, yet expensive, interrogation props and raised significant questions about the ethics of one manufacturer. To date, voice stress results have not been admitted or acknowledged by any court of law. If voice stress gadgets really worked, everyone would be using them . . . Copyright ©2008-2014 AbacusPolygraph.com. All Rights Reserved. Site Design and Implementation by Acera Technologies.